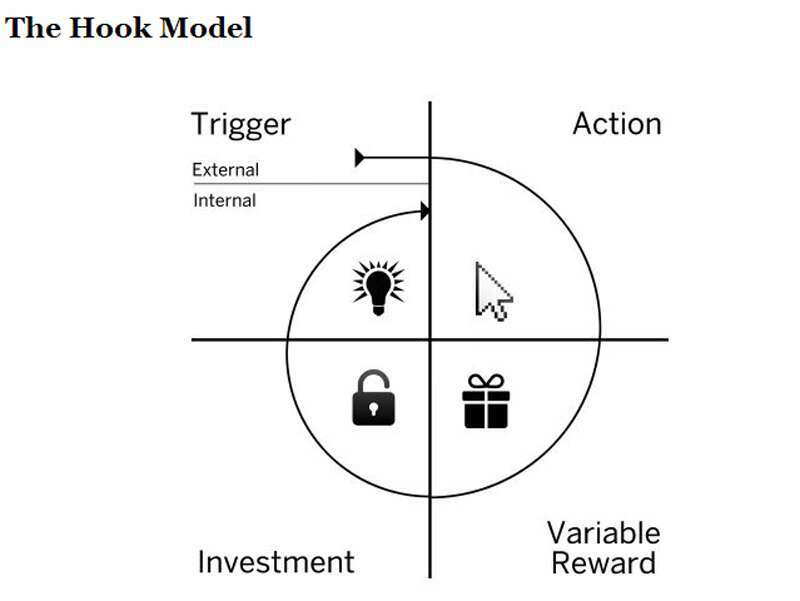 I recently finished a book called Hooked: How to Build Habit-Forming Products by Nir Eyal. The book overall expresses a nice framework for considering products and services, whether or not they should be habit-forming in the first place, and if so how to go about making that happen. The framework is very useful in that it allows for organizations to have a common language they can use to speak about their product and how they should modify or improve it. Below are my notes on a per-chapter basis, and I may follow this with another post summarizing my thoughts on the book and considerations for companies who need to add recurring users, reduce churn, and other common things. The key idea is to be first to mind (e.g., Google). To have an effect on frequency, a tech product must be attached to internal triggers. Link the product to daily routines and emotions. Triggers can be internal or external. The goal is to start with external ones and progress to internal. It’s important to make it easy to perform actions. Usability design is a big part of this step. Variable rewards come as a result of actions. There should be the possibility of a reward, but not the guarantee. Investments are required as the final step. Users must put something into the product or service. These investments can be grouped into time, data, effort, social capital, or money. The investment should improve the product or service through the next cycle. Some examples could be inviting friends, stating preferences, building virtual assets, or learning to use new features. Habits are undertaken with little or no conscious thought. Companies selling infrequently-used products do not require habitual users. Companies with rare interactions are better off acquiring customers via marketing budget. The point is to help companies who incite user action via habits, not companies who compel customer actions via other means. Habits are good because they increase Customer Lifetime Value, provide pricing flexibility because customers become less price sensitive, and can reinforce a free-to-play or freemium model. When people have habits, they involve their social circle. Viral cycle time: The time required for one user to invite another user. Habits enhance competitive advantage because people are unlikely to change their habits and therefore unlikely to change providers of the habitual product or service. Consider habits as a strategic decision. Amazon shows ads for competitors on their site because they want users to go to Amazon when they want a product. This forms user habits and Amazon makes money on the transaction as well. Is your product a vitamin or a painkiller? Vitamins do not solve an obvious pain point and appeal to emotional rather than functional needs. Painkillers solve an obvious need, relieving a specific pain, and they have quantifiable markets. Habits are not in themselves addictions. Additions are by definition self-destructive in nature. Not every business requires habitual engagement. How do users currently solve that problem and why must it be solved in the first place? How frequently do you expect users to engage with the product? Habits start with external triggers, which are embedded with information which tells the users what to do next. Paid Triggers: advertising, SEM. Use paid triggers for acquisition and use other triggers to bring users back because paid triggers can become to expensive (if users interact with the product regularly). Earned Triggers: good PR, viral videos, featured app store placement. Awareness from earned triggers is typically short-lived and therefore companies who use them must work to always keep the product in the limelight. Relationship Triggers: Word of mouth, sharing, etc. Owned Triggers: These consume space in the user’s environment. E.g., app icon on the home screen, app update notification. Owned triggers prompt repeat engagement until a habit is formed. Without owned triggers and tacit permission it’s difficult to change user behavior. These manifest automatically in your mind. Connecting internal triggers to the product is the overall goal. Emotions, particularly negative ones, are powerful internal triggers. Boredom, loneliness, frustration, anxiety are good examples. Studies have linked depressive symptoms with email usage, video watching, gaming, and chatting online. When building your product for triggers, the ultimate goal of the habit-forming product is to ease the user’s pain by creating an association so the user identifies the product with removing the pain. Declared preferences are what users say they want. Revealed preferences are what users actually want. Instagram photos you see in Facebook are a relationship external trigger. Who is your intended user? What are they doing right before the habit? What are three possible internal triggers? Which internal trigger is most frequent? Every time a [internal/external trigger] then the user [first action of habit]. Consider places or times the user is in when the desired habit could be build. What might be places and times to send an external trigger? How can you couple an external trigger as closely as possible to when the user’s internal trigger fires? Think of three conventional external triggers, then three crazy or impossible ones. To initiate action, doing must be easier than thinking. User must have sufficient motivation. User must have the ability to complete the desired action. The trigger must be present to activate the behavior. Seek social acceptance, avoid rejection. Understand why people use some product or service. Lay out steps they must take to get a job done. Start removing steps until you have the simplest possible process. Money: Final cost of taking an action. Physical Effort: Labor involved in taking an action. Brain Cycles: Level of mental effort and focus involved in taking an action. Social Deviance: How accepted is the behavior by others? Non-routine: How much does the action disrupt existing routines? On the question of starting with motivation or ability, ALWAYS choose ability. Ease of use is the most important thing. If people are motivated but don’t have the ability, then the product is useless. Cognitive biases are more important than rational economics. Scarcity Effect: Use this to drive action and sense of urgency. Show available stock if less than X units, for example. Framing Effect: Higher costs for a product provide the user with a better sense of enjoyment. Anchoring Effect: Consider one brand on sale with a higher price-per-unit cost. Endowed Progress Effect: Punch card with 8 spots versus one with 10 spots and two which are pre-punched. People receiving the 10 spot card (with two pre-punched) started with a sense of progress and therefore had an 82% higher completion rate. There is increased motivation as people believe they are nearing completion of a goal. This effect can be useful as part of an on-boarding process. Go through the path a user takes after a trigger. How many steps does it take? How does it compare with other competing or non-competing products and services for ease of use? Which resources are limiting user’s ability to accomplish tasks that become habits? Time, brain cycles, money, social deviance, physical effort, non-routine? Find three testable ways to make intended tasks easier to complete. How might you apply heuristics to make habit-forming actions more likely? The nucleus accumbens doesn’t activate on receiving a reward, but on the anticipation of receiving a reward. In other words, it’s not the reward but the need to alleviate the craving for a reward which is motivating. Tribe - Social media is anticipation of acceptance by the tribe. Hunt - Persistence hunting was used before weapons and may explain some of our product interactions. Computer gambling and slot machines are a good example of a hunt reward. Twitter and Pinterest may function in the same way. Self - Pursuing a task to completion can influence people to continue many behaviors. Consider jigsaw puzzles. Rewards of the self are intrinsic. The self-determination theory of Deci and Richard Ryan espouses that people desire, among other things, to gain a sense of competency. Adding an element of master to this goal makes the pursuit all the more exciting. Examples of this sense of competency and completion could be video games (e.g., World of Warcraft), email (reducing the number of messages in the inbox as a goal), or places like Codeacademy. Rewards must fit into the narrative of why the product is used and align with the user’s internal motivations and triggers. Companies that successfully change behaviors present users with an implicit choice between their old way of doing things and a new, more convenient way of doing things. Experiences with finite variability become predictable and therefore less engaging for users. Variable rewards must satisfy users’ needs while leaving them wanting to reengage, usually via the tribe, hunt, or self. Email uses all three in that uncertainty over who is sending the message and what it contains, or opportunities/threats to possessions or livelihood combined with social obligation to respond to be seen as agreeable and the uncertain nature and motivation to control it cover all the types. When autonomy is threatened we feel constrained by lack of choices and often rebel against a new behavior. Psychologists call this reactance. Maintaining a sense of user autonomy is necessary for repeat engagement. Experiences that maintain user interest by sustaining variability with use are better because people don’t get bored and variable rewards are better than consistent ones from a psychological perspective. Talk with five customers in open-ended interactions in order to find out what they find enjoyable or encouraging about using the product. Are there any moments of delight or surprise? Is there anything they find particularly satisfying about using the product? Review the steps required for a customer to use the product or service habitually. What outcome (reward) alleviates the user’s pain? Is the reward fulfilling, yet leaves the user wanting more interaction with the product? Brainstorm three ways your product might heighten users’ search for variable rewards using rewards of the tribe, hunt, and self. To change or form a habit, we need frequency and a change in attitude or perception about the habit. Escalation of commitment is the idea that the more users invest time and effort into a product or service, the more they value it. In fact, there is ample evidence to show that labor leads to love. The IKEA effect (Ariely): The phenomenon wherein people place greater value on things simply because they invested in their own creation. We seek to be consistent with our past behaviors. Small investments can lead to big changes in future behaviors (e.g., Tiny Habits). Cognitive dissonance is avoided because we change our perception of reality. Consider the fable of the fox that cannot reach the grapes and decices therefore that they must be sour. The previous three things together have an influence on future actions. Rationalization is a powerful thing. This effort must be worthwhile simply because I’m making it, and I’m not stupid, so I wouldn’t be investing effort in something which isn’t worthwhile. Unlike the Action step in Chapter 3, Investment is about long-term rewards instead of immediate gratification. The investment phase counterintuitively involves friction, but this friction always comes after the variable reward. The main idea with Investment is to leverage a user’s understanding that the product or service will get better through personal use and through their investment. The investment phase is the time to load the next trigger. E.g., interactions with Pinterest give the site tacit permission to contact the user regarding updates to pins or conversations. The same goes for Instagram. Review your flow. What bit of work are users doing which increases the likelihood of returning? Brainstorm three ways to add small investments to the product in order to load the next trigger, store value as data, content, followers, reputation, and skill, and to identify how long it takes for a loaded trigger to reengage your users. How can you reduce this delay in order to reduce cycle time? What do your users really want (internal trigger)? What brings users to your service (external trigger)? What is the simplest action users can take in anticipation of a reward and how can you simplify the product to make this action easier (action)? Are users fulfilled by the reward and yet left wanting more (variable reward)? Ethics of the model can be determined by understanding whether you would use the product and whether or not the product will help users materially improve their lives. Using these two questions, you can group yourself into the set of facilitators, peddlers, entertainers, or dealers. Facilitators use their own product and believe it can materially help improve the lives of others. Peddlers don’t use their product but still believe it can help others. Entertainers use their product but don’t believe it materially helps others. Dealers neither use the product, nor believe it helps others. Consider where you fall. How does that make you feel? Ask yourself if you’re proud of the way you influence the behavior of others.